Have been working on some minor but important aspects of the game: most importantly, handling the display of multiple units in the same map hex. In a cardboard wargame this is easy: you simply stack up counters on top of each other. In ArmCom2, however, this required a little work to function properly. Right now, if there are 2 or more friendly units in the same hex, the one that is being targeted, that is active, or that is next to act this turn is displayed, while others are temporary hidden. Moving the mouse cursor over a hex will always display the total number of units present, and in the future a right mouse click will bring up details of each unit in the stack. There will also be stack limits for each map hex and penalties for exceeding them. 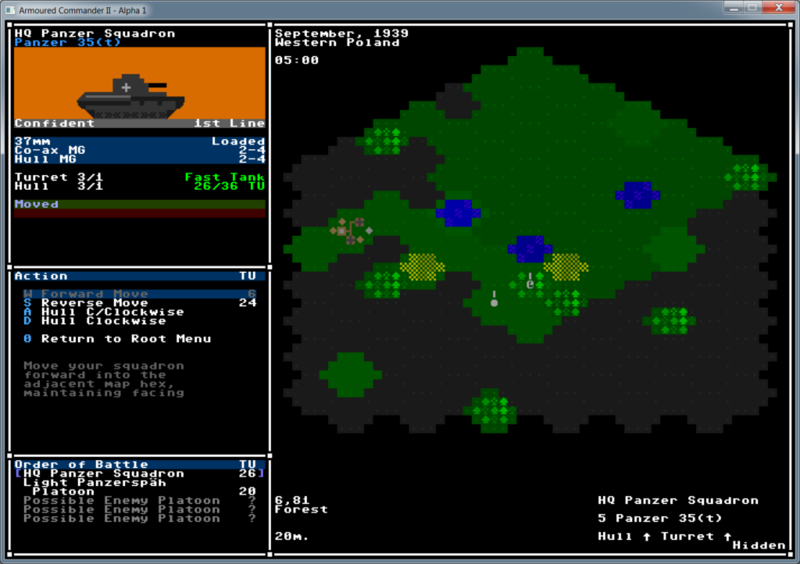 Some benefits of this system are that units are always drawn in the centre of the map hex, which keeps hex depictions from getting too crowded, especially in the future when things like rivers, walls, and smoke will be added. I’ve also added a little more detail to the map viewport, displaying the scenario’s month, year, location, and time of day. In the future, scenarios will end at a certain point of the day, and daylight (or lack thereof) will have an effect on the map. You can also see the hull and turret facing direction of any known unit on the map in the unit info console in the bottom right of the screen. It’s not shown in this screenshot, but animations relating to units acting off-viewport are handled better, and I added a mask for the edges of the map to make some planned animations easier in the future.